Both permits for construction of privately-owned housing units and beginning construction in May were well below expectations, the second consecutive month in which both declined. Each of the two measures was also below its respective pace one year earlier. The U.S. Census Bureau and the Department of Housing and Urban Development said permits for residential housing units were issued at a seasonally adjusted annual rate of 1,168,000. This was 4.9 percent off the April rate of 1,228,000 units, a revision from its original estimate of 1,229,000. The May number also fell short, by 0.8 percent, of the 1,178,000-permit pace in May 2016. Analysts polled by Econoday had been looking for permits in the range of 1,240 to 1.260 million. The consensus was 1.249 million. Single family authorizations were at a rate of 779,000, down 1.9 percent from April's reported 794,000 units, an upward revision from the original report of 789,000. The single-family rate was 6.0 percent higher than that of the previous May. Multi-family permitting was down 13.9 percent from the April at a rate of 358,000 units, and unchanged from the same month last year. On a non-seasonally adjusted basis there were 112,900 permits issued during the month compared to 102,600 in April. Single-family permits rose from 69,200 to 78,300. May housing starts fell 5.5 percent from their April level to a seasonally adjusted annual rate of 1,092,000 units, and were 2.4 percent lower than the May 2016 rate of 1,119,000 units. The April starts estimate was revised down from 1,172,000 units to 1,156,000. Expectations were for starts to be in the range of 1.170 million to 1.270 million. The consensus was 1.223 million. Single family units were started at a rate of 794,000, 3.9 percent off the April pace of 826,000, but up 8.5 percent from starts in May of last year. The April estimate was revised upward by 1,000 units. Multifamily units had a start rate of 284,000 units, down 9.8 percent from April and 25.7 percent from the previous May. On a non-seasonally adjusted basis starts totaled 102,300 in May compared to 105,700 in April. Single family starts dropped 500 units to 76,800. The negative report prompted the following statement from the National Association of Realtor's Chief Economist Lawrence Yun. "Housing shortages look to intensify and may well turn into a housing emergency if the discrepancy between housing demand and housing supply widens further. 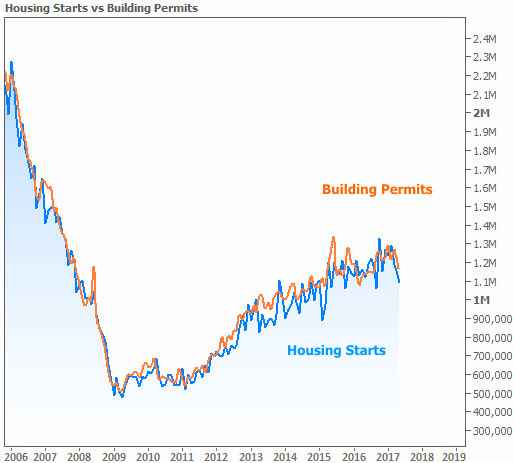 The falling housing starts and housing permits in May are befuddling given the lack of homes for sale and the quick pace of selling a newly-constructed homes. Meanwhile, job creations of a consistent 2 million a year will push up housing demand further. One thing that moving up is the housing costs for consumers: higher home prices and higher rents." The rate of completions did rise, to an annual rate of 1,164,000 units, 5.6 percent ahead of the revised (from 1,106,000 units) estimate of 1,102,000 units in April and up 14.6 percent from the May 2016 rate of 1,016,000. Single-family completions gained 4.9 percent to a rate of 817,000, 12.8 percent above the previous May's estimate. Completions of multifamily units rose 12.0 percent to 335,000 units, 18.4 percent more than a year ago. On a non-adjusted basis, there were an estimated 96,700 housing units completed in May, compared to 83,900 in April. Single family completions rose from 60,300 to 68,600. At the end of the reporting period there were 146,600 construction permits outstanding, 80,700 of them for single family units. Work was underway on 1,076,400 units, 458,600 of which were single family houses. All figures are unadjusted. Permitting in the Northeast rose 3.3 percent from April and was 20.4 percent higher than in May 2016. The rate of starts was unchanged from April, rising 8.8 percent year-over-year. Units were completed at rates 23.3 percent and 60.9 percent higher than in the two previous periods. In the Midwest, permits declined 9.4 percent month-over-month and were down by 1.7 percent on an annual basis. The pace of housing starts dropped by 9.2 percent for the month and 11.6 percent year-over-year. Completions lagged the previous month by 17.7 percent and were 12.1 percent lower than the prior year. There was a slip of 0.3 percent in the number of permits issued in the South compared to April, but the rate was up 1.9 percent for the year. Starts retreated by 8.8 percent from the previous month and by 9.9 percent from last May. The rate of completion rose 2.4 percent from April and was 12.6 percent higher than a year earlier. The West saw both month-over-month and year-over-year drops building authorizations; 13.1 percent and 11.7 percent respectively. Starts did rise, gaining 1.3 percent for the month and 17.4 percent annually. Completions were up by slightly more than 25.6 percent and 25.1 percent from the prior periods.